After working in OpenRoads for a while you may notice that the size and color of the Manipulator is rather hard to read. Maybe I am getting old and delaying the need for readers, but the blue text on the black background seems a little hard to read. From the MicroStation pull down menu go to Workspace > Preferences. 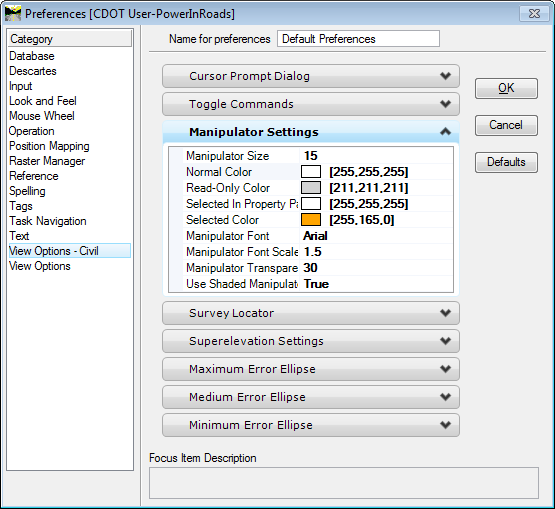 On the left-hand side select the category View Option – Civil and expand the Manipulator Settings. Change the Normal Color, Manipulator Size, and Font Scale of text to your satisfaction. Note: Because this is a User Preference change it remains set for all drawings you open.